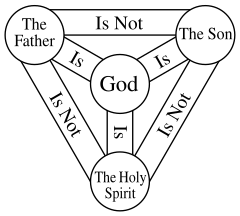 In the Christian religion, the Trinity is an idea used to explain that three different persons are called God in the Bible: God the Father, God the Son, and God the Holy Spirit (who is sometimes called the Holy Ghost). Trinity states that these three all form the same God. Many but not all Christians worship God in the form of the Trinity. In the Old Testament there are several places where there seems to be evidence for a Trinity. Genesis 1:26 states that God said "Let us make man in our image". Deuteronomy 6:4 states that “The Lord our God is one Lord”. The word that has been translated as one can also be translated as united. 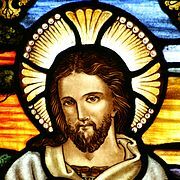 It was several hundred years after the life of Jesus before many Christians accepted the idea that God was a Trinity. It was a difficult idea, because the Hebrew scriptures talk about God being One. The Greeks and the Romans could only understand Christ as a person who was bringing God’s Word. It was not until the 4th century that the three were recognised as being the three parts of one whole God. This was decided by the Council of Nicaea in 325. By the end of the century many Christians had been swayed to believe in God as a Trinity. ↑ "Lewis and Short: trinitas". ↑ "Lewis and Short: trinus". ↑ Liddell & Scott, A Greek-English Lexicon. "entry for Τριάς". Retrieved December 19, 2006. ↑ Theophilus of Antioch, "To Autolycus". , II.XV (retrieved on December 19, 2006). ↑ "Against Praxeas, chapter 3". ↑ "History of the Doctrine of the Trinity". Retrieved September 15, 2007. ↑ "Christianity". MSN. Retrieved 2009-09-06. ↑ Qur'an 3:79-80, 112:1-4, etc. This page was last changed on 25 March 2019, at 15:10.